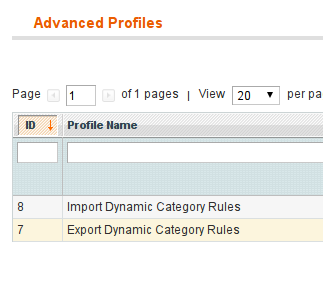 Version 4.21.0 introduces a long due feature: The ability to import / export rules. Below is a short guide on how to use the functionality, but if you are already familier with the dataflow import/export procedures, you will feel at home. The extension will insert two advanced dataflow import / export profiles. You will see the profile XML as the first view. You will be presented with the profile run button. Simply click this button to start. You will be presented with the export progress display. Note this screen may appear after a while of blank screen. ATTENTION: The source and destination must share the same category structure, and specifically the same category ids. If you make any changes, please remember to save. 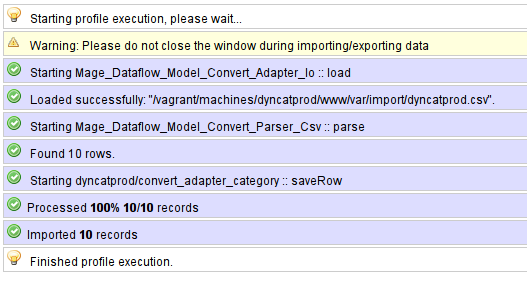 First copy your previously exported dyncatprod.csv file to the configured import folder. You will be presented with the import progress display. Once completed you have imported the rules. They must still be actioned, which can be done via ron, or via the command line tool, or simply by saving the category in admin.